I created this installation at Jamaica Pond in Boston, Massachusetts towards the end of a long New England winter. 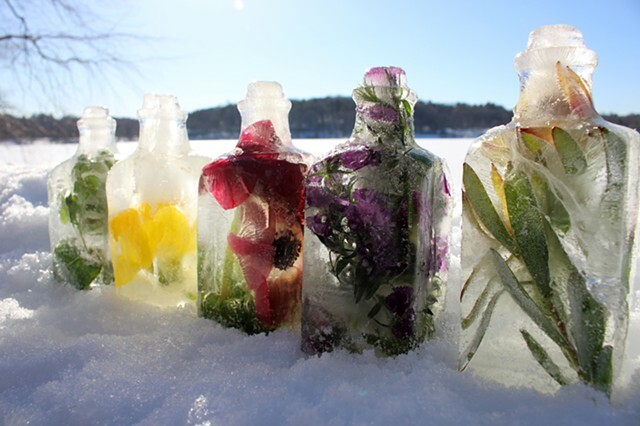 The piece consisted of five bottle- shaped forms made of ice and containing various frozen flower and plant specimens. Over the course of the next several days I visited the site to photo-document the melting process and the temporary formations that emerged. I chose the location of Jamaica Pond because of its popular destination as a walking path for local residents and also for its historic context. Jamaica Pond is considered a gem of the Emerald Necklace in Boston, a strand of parks and parkways designed by Fredrick Law Olmsted in the late 1800s. As a kettle pond, its formation began thousands of years before that as a result of the melting of ancient glaciers. I wanted to reference this near and ancient past, exploring natural processes in the context of personal and collective memory, and a shared natural history.